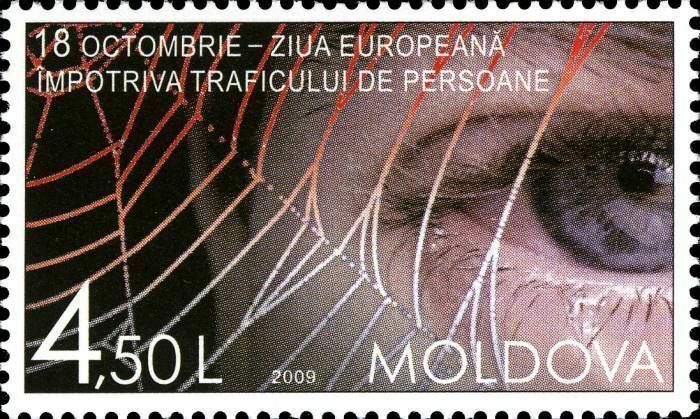 On 18 October 2009, the Post Office of Moldova (Poșta Moldovei) issued a postage stamp with the title European Day Against Trafficking in Human Beings. The issue comprises one stamp, with an associated cancellation (postmark) and first day cover (FDC). The designer was Vitaliu Pogolşa. The printing was performed by Tipografia Centrală, Chişinău. Human trafficking is the trade in humans, most commonly for the purpose of sexual slavery, forced labor or commercial sexual exploitation for the trafficker or others, or for the extraction of organs or tissues, including surrogacy and ova removal. Human trafficking can occur within a country or trans-nationally. Human trafficking is a crime against the person because of the violation of the victim's rights of movement through coercion and because of their commercial exploitation. Human trafficking is the trade in people, and does not necessarily involve the movement of the person to another location. Read more.. This article uses material from the Wikipedia article 'Human_trafficking', which is released under the Creative Commons Attribution-Share-Alike License 3.0.